Age-related macular degeneration (AMD) is the deterioration of the part of the retina responsible for central vision and fine detail, called the macula. The macula only makes up a small part of the entire retina, but it is what allows you to read fine print, thread a needle, and read street signs. There are two types of macular degeneration, dry and wet. Most people who have macular degeneration, have the dry form. There is not any current medication or treatment for dry macular degeneration, but some people may benefit from vitamin therapy. About 10 percent of patients with macular degeneration, develop the wet form. The wet form occurs when new, abnormal blood vessels begin to grow underneath the retina and leak fluid or blood. The earlier wet macular degeneration is treated, the better chance the patient has of preserving the central vision. The doctors at the Kansas City Eye Clinic diagnosis and monitor patients with age-related macular degeneration. Our doctors work very closely with an established retina clinic, located conveniently across the street next to Shawnee Mission Medical Center, for patients that develop wet macular degeneration or any other retinal disease. For our patients’ convenience, we also have a retina doctor see patients in our office once a week. Patients who are experiencing trouble reading or doing daily activities due to decreased vision from macular degeneration, can schedule a Low Vision Evaluation with Dr. Stephen Nichols. At this appointment, the doctor will show the patient different devices and aides to help maximize his/her vision. Read more about our Low Vision services here. 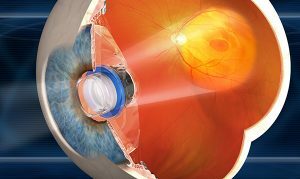 For patients with advanced dry macular degeneration, new technology has now become available in the United States called the Implantable Miniature Telescope. This technology provides patients with magnified central vision in one eye while the other eye provides peripheral vision. Patients must meet the FDA guidelines to be a candidate for surgery and then go through an evaluation by the surgeon, Dr. Christopher Ketcherside, and an occupational therapist at Alphapointe. For more information on the surgery or to see if you are a candidate, please visit CentraSight or call Mary Galloway at 913.322.9148.